An exciting new international research project led by the University of Nottingham will focus on developing new Blue-Green futures for cities, where multifunctional infrastructure is used to address water challenges. This research is funded by the British Academy’s Tackling the UK’s International Challenges programme (January 2019 to July 2020). Emily O’Donnell gives a short introduction in this blog. There is a recognised need for a fundamental change in how cities manage water in response to increasingly frequent and extreme rainfall events, drier summers and urban expansion. Approaches centred on ‘living with and making space for water’ are increasingly adopted internationally and address the full water spectrum (floods to droughts). These include the Dutch ‘Room for the River’ programme and Australian Water Sensitive Urban Design initiatives. These approaches are essential components of visions for Blue-Green futures. Futures that embrace Blue-Green principles are characterised by resilient and sustainable flood and water management approaches. Nature-based solutions, sustainable drainage systems (SuDS) and Blue-Green Infrastructure (e.g. green roofs, swales, rain gardens, detention basins and ponds) are widely employed. These approaches enrich society through the provision of multiple co-benefits. These include access to public greenspace, recreational opportunities, aesthetic enhancements, and improved management of environmental processes such as flooding, drought, urban heat, water and air pollution. This project brings together international researchers from three continents in a collaborative exploration of how the socio-political barriers to Blue-Green Infrastructure may be overcome to progress cities towards Blue-Green futures. Futures are founded on widespread implementation of infrastructure that creates multiple co-benefits to the environment, economy and society. Through an analysis of explicit and implicit preferences and examination of how social learning may build capacity, we investigate how new forms of environmentally sustainable urban governance can be developed to address current water management challenges. 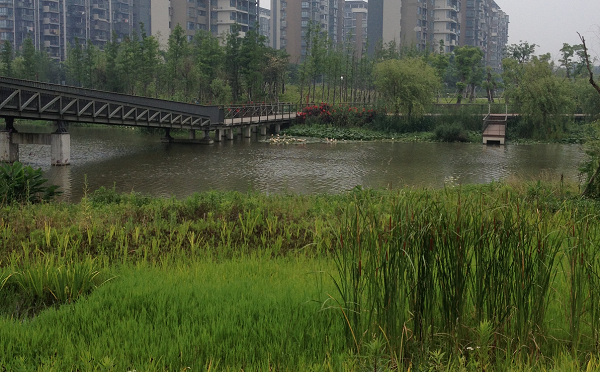 We focus on four cities that are known for their Blue-Green infrastructure advances yet have different governance approaches, challenges, perceptions and urban water narratives. Figure 1. Our four international case studies. 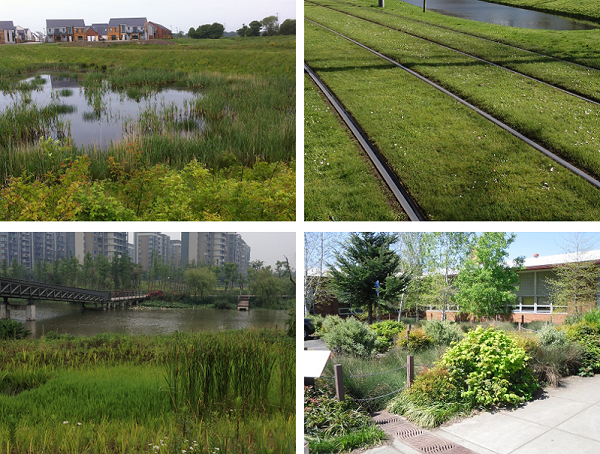 From top left and clockwise: sustainable drainage pond in Newcastle, green tram tracks in Rotterdam, the Ningbo Eco-corridor, and a school raingarden in Portland. We will explore how Blue-Green visions were developed in these cities, what the drivers for these were, and how learning could be applied in other cities. UK: Simon Gosling (PI), Emily O’Donnell (researcher), University of Nottingham. China: Faith Chan (Co-I), University of Nottingham Ningbo China. USA: Noelwah Netusil (Co-I), Reed College, Portland Oregon. Netherlands: Nanco Dolman (Co-I), Royal HaskoningDHV, Amsterdam. We’ll be disseminating our research finding and other interesting papers on social media (follow us on Twitter @BlueGreenCities), this blog and future webinars. Subscribe to our blog updates to keep informed on our research progress. We’d love to discuss paths to Blue-Green futures with you so please send us your thoughts via the comment box or Twitter. For further information please contact Emily O’Donnell.